﻿2018-2019 ﻿is ﻿the ﻿38th ﻿season ﻿since ﻿the ﻿inception ﻿of ﻿Pro ﻿Coro ﻿Canada. ﻿Pro ﻿Coro ﻿Canada ﻿has ﻿the ﻿great ﻿fortune ﻿to ﻿have, ﻿in ﻿its ﻿own ﻿membership, ﻿some ﻿of ﻿the ﻿finest ﻿singers ﻿in ﻿Alberta, ﻿many ﻿of ﻿whom ﻿have ﻿gone ﻿on ﻿to ﻿distinguish ﻿themselves ﻿as ﻿soloists, ﻿such ﻿as ﻿Nathan ﻿Berg, ﻿Wendy ﻿Humphries, ﻿Frances ﻿Jellard, ﻿Michael ﻿Meraw, ﻿Linda ﻿Perillo ﻿and ﻿John ﻿Tessier. ﻿Pro ﻿Coro ﻿Canada ﻿also ﻿enjoys ﻿joining ﻿with ﻿choirs ﻿from ﻿around ﻿the ﻿world, ﻿and ﻿has ﻿performed ﻿with ﻿Calgary ﻿Boys’ ﻿Choir, ﻿Elmer ﻿Iseler ﻿Singers ﻿(Toronto), ﻿Richard ﻿Eaton ﻿Singers ﻿(Edmonton), ﻿Schola ﻿Cantorum ﻿Choirs ﻿(Edmonton), ﻿Stockholm ﻿Chamber ﻿Choir, ﻿Studio ﻿de ﻿musique ﻿ancienne ﻿de ﻿Montréal, ﻿Swedish ﻿Radio ﻿Choir, ﻿Tafelmusik ﻿Chamber ﻿Choir ﻿(Toronto), ﻿University ﻿of ﻿Alberta ﻿Madrigal ﻿Singers, ﻿Vancouver ﻿Chamber ﻿Choir, ﻿and ﻿Winnipeg ﻿Singers. ﻿Pro ﻿Coro ﻿Canada ﻿has ﻿had ﻿the ﻿opportunity ﻿to ﻿perform ﻿large ﻿choral ﻿works ﻿with ﻿fine ﻿instrumental ﻿ensembles: ﻿Alberta ﻿Baroque ﻿Ensemble, ﻿Edmonton ﻿Symphony ﻿Orchestra, ﻿Hammerhead ﻿Consort ﻿(Edmonton), ﻿Musica ﻿Antiqua ﻿Köln ﻿(Germany), ﻿Netherlands ﻿Chamber ﻿Orchestra, ﻿Orchestre ﻿de ﻿Lyon ﻿(France), ﻿Pacific ﻿Baroque ﻿Orchestra ﻿(Vancouver), ﻿Paco ﻿Peña ﻿(Spain), ﻿Red ﻿Deer ﻿Symphony ﻿Orchestra, ﻿and ﻿The ﻿Whole ﻿Noyse ﻿(San ﻿Francisco). 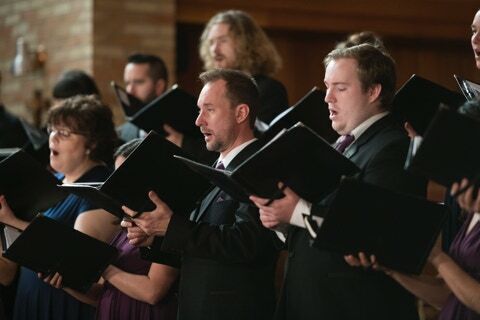 ﻿In ﻿addition ﻿to ﻿an ﻿eight ﻿concert ﻿subscription ﻿series ﻿in ﻿Edmonton, ﻿the ﻿choir ﻿performs ﻿regional ﻿concerts ﻿in ﻿surrounding ﻿Alberta ﻿centres, ﻿and ﻿tours ﻿have ﻿been ﻿undertaken ﻿to ﻿Europe ﻿and ﻿Eastern ﻿Canada. ﻿The ﻿ensemble ﻿has ﻿served ﻿as ﻿demonstration ﻿choir ﻿for ﻿various ﻿choral ﻿festivals, ﻿has ﻿conducted ﻿vocal ﻿master ﻿classes ﻿with ﻿such ﻿vocal ﻿stars ﻿as ﻿Emma ﻿Kirkby ﻿and ﻿Catherine ﻿Robbin, ﻿and ﻿has ﻿run ﻿a ﻿touring ﻿program ﻿of ﻿choral ﻿education ﻿for ﻿primary ﻿and ﻿secondary ﻿schools.